English Summer School based near London. Learn English with our high quality lessons and activities. Unforgettable experience for international students. It is vital that our campers are aware of our rules at XUK. These are in place to ensure that every camper is happy, healthy and most importantly safe during their stay with us. Please go through the 'XUK Way' with your children before their stay. Coloured Teams and individual campers will be awarded Championship Points throughout their stay for a number of reasons: politeness and manners, teamwork, being helpful, winning an Evening Activity etc. At the end of each week, the winning Coloured Team for the week will be presented with certificates and prizes during the Talent Show! Each week we present the ‘XUK Star Student' award. This will be given to the best ‘student’ at camp, who our leaders decide best sums up what’s good about XUK – a sense of humour, friendship, puts in 100% to their English lessons and a desire to make the most of camp. There will be a presentation each week and each winner will be offered one free week at one of our camps next year! We will expect / assume you are coming directly to XUK unless you have specifically booked (with us) otherwise. Seats on transport runs are only guaranteed with full payment. You must look at ‘Getting to XUK’ for information about flight and train times and the airports and station we pick up/drop off your children. There will be a wait at the airport or station. It is essential that you pack a snack for your child to have on their transfer. •	Arrival day: check-in is between 15:30 and 16:30. Please do not arrive before 15:30. To ensure that the camp is at its best, we will not check in your child before that time. It is vital that your child packs for their stay or assists you. Upon their return, they will need to pack their belongings back into their bags independently. We understand that that this may be a new, and difficult, experience and it is crucial our staff are the first point of contact for your child to make their stay as fun and easy as possible. It is important to tell them prior to camp starting that being homesickness is normal and we are there to support them if they are feeling homesick. Please help us help your child by telling them before and during camp to always talk to staff if they have any problems or concerns. If you (the parent) have any concerns, we also urge you to contact us and we can discuss anything relating to your child. Both of the above numbers are not emergency lines and are not manned 24/7. Delivery of the post is very exciting for those who receive letters. The address is ‘XUK, c/o St Joseph's College, Belstead Road, Ipswich, IP2 9AX. Any food sent (or brought to camp) may be checked. This is for the health and safety of all children and staff, some of whom have very specific allergies.You can also send emails to your children to xukenglish@hotmail.com. These are handed out at the next available meal time. Daily updates and a selection of photographs from the day will be uploaded to our XUK English Facebook page and Instagram. You can view all of the photographs from each day on your CampInTouch account. It is essential that you complete the Health & Medication Form on your CampInTouch account. If your child is bringing medication to camp, you must complete page 5 of the Health & Medication Form. It is essential that we have this information to be able to administer medication.All medication must be brought to camp in a named sealed bag or container. We will store medication in a safe and secure place. •	Money in a clearly marked envelope for our staff to put in our Camp Bank for safekeeping (this is optional). Campers will have access to this money at set times. •	Passports & tickets. We keep these for safekeeping. As described above under 'Health'. Children staying for longer than one week who require laundry may pay for this service on site. There is a charge for this (£6 per bag - this can be shared among friends in a dorm) and will be taken off their pocket money. This service is not suitable for delicate or expensive clothes, which should be washed by hand or not brought at all. All clothing will go through a washing machine AND tumble dryer. We advise all children to bring a net laundry bag! Clothes that are not clearly labelled with your child’s name will be at risk of being lost if they are washed. This is your and your child’s responsibility. Please clearly label everything. We have the right to label with marker pens to help minimise lost property. We advise approximately £35 - £40 per week, which should be sufficient. Pocket money can be spent on camp to buy merchandise or to buy snacks & souvenirs on trips. 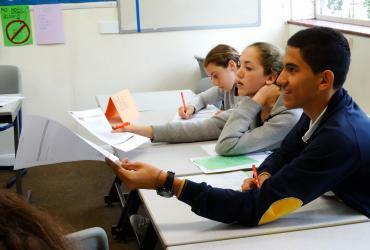 At the beginning of each week we will give all children a test to assess their standard of English. We will assign them a group accordingly. On five mornings every week children will have English lessons. Other times will be taken up by activities, meals, trips and free time. Please ensure your child is ready to learn English and that they understand what they are coming to us for. It is also a good idea for you and your child to decide in advance if there is anything particular they wish to work on. Every Tuesday afternoon, we go on a study trip to a local town or seaside. Students will have tasks to complete as well as a chance to buy some souvenirs. We will be going on a whole camp trip every Thursday to either London or Cambridge. It is an opportunity to do a bit of shopping and sight seeing whilst soaking up British culture. If you’d like to book an optional extra, you must let us know before camp starts. There are limited places on all extras and they are booked on a first come first served basis. Please note that days & details of optional extras are subject to change. For our Tuesday and Cambridge trips we give parents of 16 and 17 year olds the option to let them go around town in small groups without being accompanied by our staff. In order to opt in to this, parents must complete the electronic permission letter which you will be able find on your CampInTouch account. Please do not hesitate in getting in touch if you have any questions prior to camp beginning and have a look at our Frequently Asked Questions page.